There once was a sister missionary serving in my ward that always told me "God is so aware of you." I reflected that often as I served a mission in Houston Texas. I made it a goal to always look for the signs He was giving me, that would allow me to see His hand in everyday matters. There was one particualar Sunday that I was feeling down. My companion and I weren't getting along the greatest, the work was slow, and I was feeling homesick at the time. We were in Relief Society and were divided into separate groups during the lesson. I was sitting next to women I didn't know, so they were asking me the typical missionary questions like, how long have you been out? Where are you from and so on. After telling them I was from Arizona the lady to the left of me leans over and says, "You don't happen to know where St. Johns is do ya?" *mini freak out* Her name was Chanda Shreeve and come to find out, she and my mom had gone to high school together and had grown up in the same ward. She helped me feel at home, in a state where I was a stranger, and i know this was a blessing sent from above just for me when I needed it. She took good care of us, and fed us the last few weeks before I was transferred to a new area. It really showed me that God was aware of me. Not only was this a tender mercy for me, but for my mom as well. She had been praying for me and was comforted to know I was in good hands and being taken care of by an old friend. 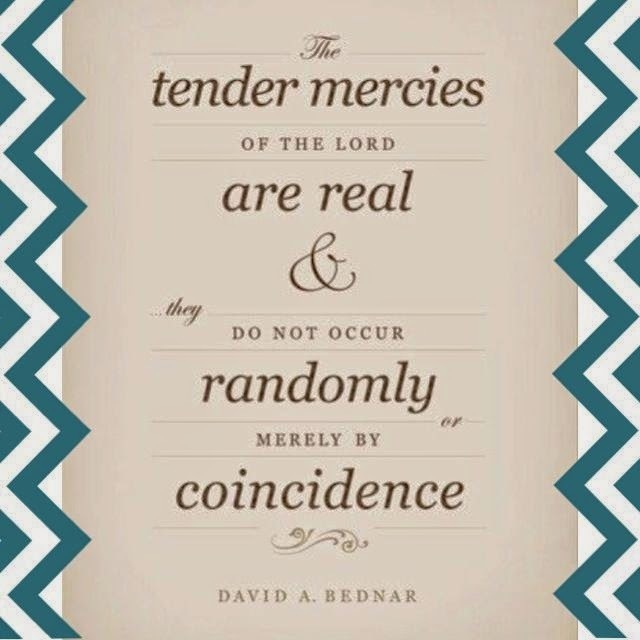 I experienced many many more tender mercies as I began to look for them. It really opened my eyes to how much we are truly loved. It changed my attitude and my thoughts. I was more positive and happier. In a world that is filled with negativity and temptations that question our beliefs, it's easy to not see the hand of God everyday. But I know that as we open our eyes and take the time to look, tender mercies are all over. He is waiting and willing to bless us. We must first do our part and look in faith just as it says in 1 Nephi 1:20. I now know that St. Johns is indeed the smallest biggest town ever, but also that God is so very aware of us. Just open your eyes and look! I promise you will see the hand of God everyday and will have a happier life. Thanks for the reminder Kailey! I think I sometimes get so busy with every day responsibilities that I forget to look for God's hand in the simplest of things. This will definitely be my goal for the week! I love this for many reasons, but most of all for the example Chanda set for me. She made the effort to talk to you, find out about you, and then she followed up by taking care of and feeding you. Sometimes I'm so caught up in my own world that I don't take the time to do those things that truly matter in caring for others. Thank you for this message! Great reminder to look for God's hand in our lives always and to look for blessing be they big or small. Thank you.